But Rachel Elder did need to inform Mr Mayor, since it’s he who opines that [singularly ???] “weightless” manufacturing will one day make Dunedin great. A while back Mr Mayor lauded expansion at Speight’s, Emerson’s and Greggs ….but recently, dreadfully, when interviewed by John Campbell on RNZ Checkpoint, Mr Mayor had trouble remembering these and other multimillion-dollar manufacturing investments in the good people, raw products and knowhow of Dunedin City. As well, he slipped past the convenient fact that the deputy mayor is a director of Scott Technology Ltd, and his old flower Mr McLauchlan, advisor and confidant, is the company’s board chairman. Notwithstanding, Ms Elder thought it necessary to set herself a free writing project, an op-ed to ‘tell’ Mr Mayor, as well as advertise her paid work skills. Yes, yes, we’re all for free speech and pumping political mileage; however, we are the converted and connected, we know just how great Dunedin manufacturing is and can be —if not for DCC. It must be said, though, that Mr Mayor’s speech at the Cadbury protest in the Octagon last Saturday was a large complimentary step up from the fatal Checkpoint phone interview. OPINION As an employment consultant and someone who advocates for a wide range of jobs in Dunedin, I am keen for Dunedin to be advertised nationwide as a place that is great for manufacturing and production as this will supply jobs to our skilled workers. The fact is Cadbury is owned by a multinational that has caused its demise. Manufacturing can be done here well and efficiently. As a city councillor Ms Elder should be overtly aware that the Dunedin City Council-owned power distribution company Aurora Energy Ltd does not and cannot offer a safe and secure electricity supply network for businesses, manufacturers and other large power users (this aside from the now obvious inability to offer safe supply to residential users). The mayor and councillors are not listening and not communicating clearly on the state of Aurora’s burnt asset. Thankfully, the Otago Daily Times has filled that void with strong news reporting. At a cost of one billion dollars to repair and upgrade the existing lines and facilities – not counting the cost of new development work required in Central Otago and Lakes District to meet growth and increasing infrastructural demand – there will shortly be a very heavy impost landing on all local businesses via rates increases. Such an unpopular debating topic at the head-in-the-sand Dunedin City Council. Farra Engineering’s latest $1.3 million machining kit not only has the capacity to work 24/7, but can text its progress to operators day and night. The DMG Mori “multi-pallet (work bench) horizontal machining centre”, supplied by a German-Japanese merged company, has been running for about a fortnight, at Farra Engineering, Dunedin, chief executive John Whitaker said. The DMG Mori could work on castings weighing just a few grams, on pieces weighing up to three tonnes, and castings up to 1.4cu m in size. “Being so productive, we’re going to the marketplace to fill the spare capacity,” Mr Whitaker said. 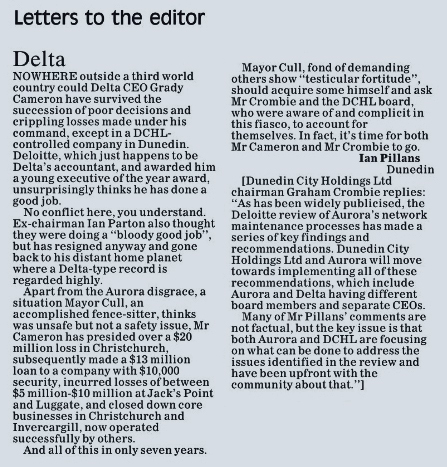 We know Delta feel free to play with the truth – But would they lie to the Courts? 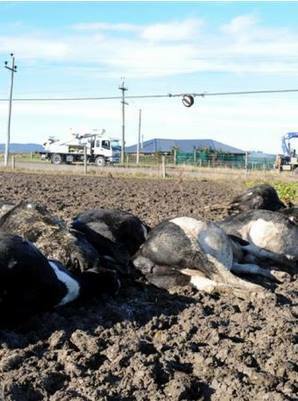 It’s obvious that Delta think nothing of spinning the facts for you or me, think back to last December when a high voltage line fell to the ground in Tainui, burning the grass. Delta said, and I quote “it presented no danger to the public”. I guess, because no one was under it at the time it fell, you could argue that the statement is true. To me it’s like claiming that firing a gun down the Prince’s St presented no danger to the public because you didn’t hit anyone. Your call, was that a lie? Or how about this one, when a cast iron cable termination fractured in several places showering the pavement with molten tar – “Delta marketing and communications manager Gary Johnson said the Havelock St pothead was found to have a “slow leak” of insulating material and was removed.” I suppose we could argue about the definition of slow, I’m sure the bitumen that came out did so very slowly – compared to the speed of light – but to characterise a failure that split a cast iron vessel many millimeters thick as a “slow leak” is disingenuous at best. Would you call that a lie? 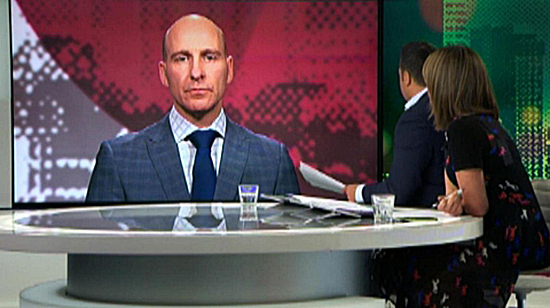 In his second interview with TV3 Grady Cameron claimed that he wanted to talk to me about the issues that I’d raised but that I had resigned before he had the opportunity. Technically he is absolutely correct, I had resigned. What he didn’t say was that I was working out a months notice, that I was at my desk, with my cellphone on and my computer in front of me when he had me “quarantined” and removed from the office. Not only that, but he cancelled a meeting that I had been told to attend with both Grady and Matt Ballard (more about him shortly) the next day. Would you call that a lie? The question that I’ve been considering for the last month or so is – would they lie in court? 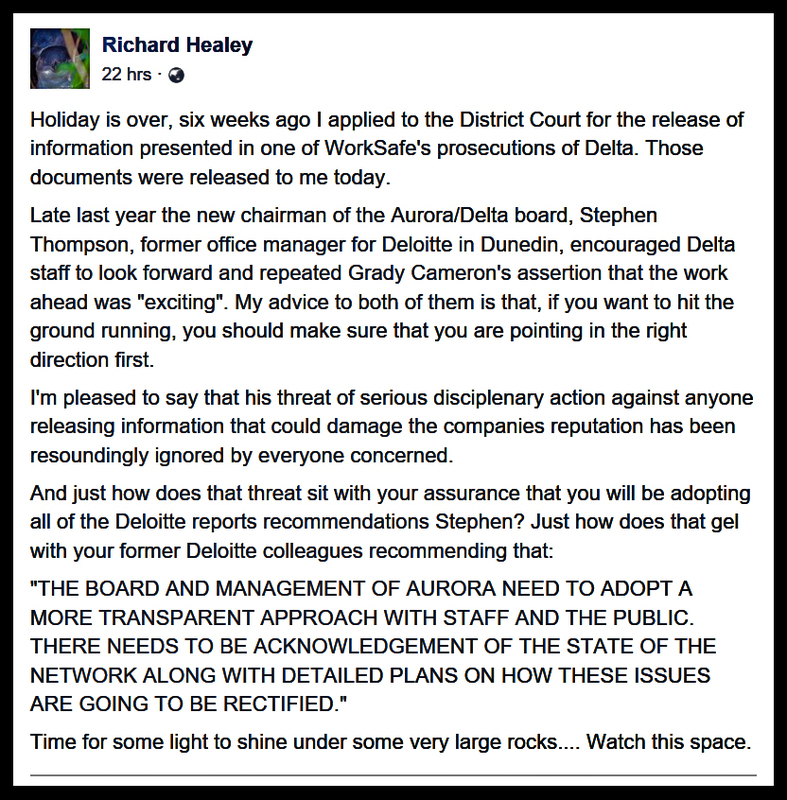 The following note at Facebook also includes a LGOIMA request directed to Grady Cameron, CE Aurora/Delta, and his interim reply. Reiteration of the SAFETY VIDEO showing at Richard’s Facebook note – please share it widely. Watch what to do and not to do in the event of a power line contact. █ For more, enter the terms *aurora*, *delta*, *dchl*, *dangerous*, *poles*, *richard healey*, *gigatown*, *roses*, *grady*, *cameron*, *crombie*, *luggate*, *jacks point*, *auditor-general*, *noble*, *yaldhurst* or *epic fraud* in the search box at right. Dunedin City Council-owned company [Aurora Energy Ltd] was showing signs it would return to its old ways as soon as public pressure began to lift. 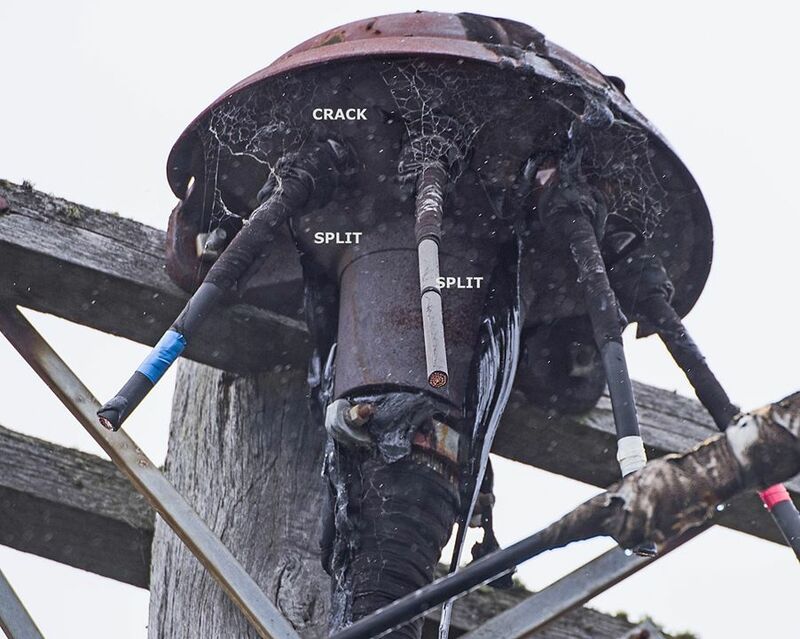 The former director of Aurora Energy’s $30 million accelerated pole replacement programme says it is doomed to fail and believes the company faces a billion-dollar spend to upgrade its network. Jarrod Stewart says he quit the role last month in part because he believed the programme to replace thousands of compromised poles would be mishandled so badly someone would be injured. “I don’t enter jobs with the premise that I am going to fail,” Mr Stewart said. His claims were yesterday disputed by Aurora and Delta chairman Steve Thompson, who said they were “exaggerated” and it was disappointing he had gone public after leaving the company. For real change to happen there needed to be a clean-out of management and the appointment of a “fixer” chief executive with an appetite for change and a willingness to make unpopular decisions. Did Grady get a tour of dangerous poles three years ago – or not ? Was he shown just ONE pole at Green Island/Abbotsford. Who would we rather believe. A fortnight ago, we brought you the story of thousands of dangerous power poles which are putting lives at risk and have already been responsible for a death. The poles are the responsibility of lines company Delta and are dotted around Otago. A whistle-blower walked out on a 30-year career in electricity to speak out because he said management weren’t listening to his safety concerns. Richard Healey estimated there are 3000 power poles which need to be replaced. Today, Delta said they need to make dramatic changes and they will borrow $26 million dto replace 3000 power poles by the end of next year. Why did it take one man’s death and a whistleblower to speak out before the company acted? Delta CEO Grady Cameron finally speaks to Story. █ For more, enter the terms *aurora*, *delta*, *dchl*, *dangerous*, *poles*, *gigatown*, *grady*, *cameron*, *crombie*, *luggate*, *jacks point*, *auditor-general*, *noble*, *yaldhurst* or *epic fraud* in the search box at right. “If you have a property where the lines were built before 2001, then Aurora owns everything up to the house. The only exceptions are where the lines have been brought up to standard and a letter has been sent to the property owner transferring ownership of the lines or a prior agreement is in place. That has almost never happened in Dunedin. If you think that you have been billed, and shouldn’t have been, write to Aurora. If you don’t get redress file a claim. If you would like to read the appropriate legislation, look up the electricity act 1992 and search for the definition of “point of supply”.